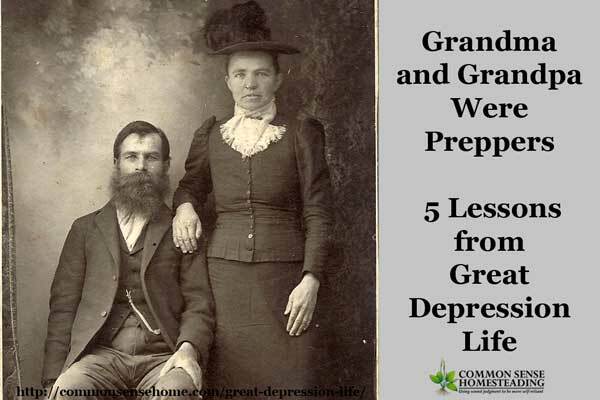 My mom's parents would be referred to as preppers if they were living in today's world, but back in the day, they lived like many country people did. Great Depression life wasn't easy, but their daily choices afforded them more abundance than many, especially once rationing set in during the second World War. Mom used to tell me stories about growing up on their small diversified farm, and I always admired the ingenuity and determination of the two of them. Grandma and grandpa passed on when I was still very little, so I didn't get a chance to know them well, but I will always remember these lessons, and pass them along to my children – and you. Grandma raised large flocks of laying hens, which she replaced annually as production dropped off. Some birds were canned, some were sold to neighbors as stewing birds. She had a big kerosene incubator, and used that in combination with broody hens to hatch the different types of poultry. Grandpa raised geese, cows and pigs, and had horses for farm work and other heavy jobs. They had a large garden, with a sizable area just for breadseed poppies. Grandma was Czech, and you had to have poppyseed for kolache and other baked goods. Although grandma and grandpa passed when I was just a toddler, I still remember grandma's yellow raspberries, and grandpa with the geese. Grandma had bees, which they used for beeswax and honey, which was a real blessing during WWII when sugar was rationed. Momma once showed me the ration coupons she'd saved from when she was a little girl. They butchered and canned their own meat, and rendered their own lard for cooking. Each summer and fall the cellar was stocked well with home canned goods. When money was tight and food was rationed, the family was always well provided for off of their own land. It may not be polite to talk about such things, but mom's parents acquired their main homestead because others defaulted on their loan and taxes and lost the property, and grandpa had the money to pay off the debt and take over. When they first moved to the site, they lived in an old granary that was overrun by mice and rats. It was pretty nasty to live in at first, but grandma made do and got the place clean enough to live in while grandpa built the house. Mom said went she went to school, she could always tell the poor girls from the more well off girls, because the poor girls (like her) wore flour sack dresses. Her mom would take her to the general store and let her pick out the print she wanted for her dresses. Nothing was wasted. Grandpa used a large scoop pulled by horses to excavate the foundation for the home he built for them by hand with the help of their hired hand, who mom referred to as “Injun Joe”. He and Joe built their dairy barn and other outbuildings, too. Mom told me a funny story about the barn. When they moved to the site, there was an old barn in rough shape that needed to be replaced. Grandpa took out a lot of the fasteners, hoping that a good wind storm would finish the job, but the barn kept standing. Finally, he gave in and tore the barn down by hand and built a new one. Not long after the new barn was up, a tornado came through – and landed right on the barn. Grandpa had to rebuild again. Not “funny” funny, but what are the odds? They had an ice house for keeping things cool, so each winter they gathered ice off of a local lake. There was no electricity in the house until grandpa rigged up a windmill with a battery bank. Mom said she and her brothers would get in trouble for flipping the light switch off and on just to marvel at how it worked. The neighbors got together to work on projects, like stripping feathers for fluffy down feather ticks (mom used to call them “pierzynas”) and for quilting bees and ice hauling. Many hands still make for lighter work, especially with very time consuming and tedious projects. Card parties and dance socials were still regular gatherings where you could talk and catch up on local events. People knew and cared about their neighbors. You may recall that the Great Depression (October 1929 – late 1930s) coincided with the Dust Bowl period of the 1930s, when severe drought swept much of the country. Pastures and hay fields dried up, and fodder was hard to find to keep the cows fed. Grandpa drove the cows every day to graze on a brush covered area of the property to keep the herd alive. On a smaller scale, grandma enjoyed fresh tomatoes, which of course don't grow very well here in Wisconsin for many months of the year. To support her tomato habit, grandma kept a plant growing inside in a south window all through the winter, hand pollinating the blossoms so she could have fresh tomatoes. It's important to preserve the old skills while making room for the new. Figure out what works for you – where you are, with what you have. Don't be afraid to try new things and tackle big projects – just create a support system that helps you complete them. Do you have any family stories from the Depression Era that you'd like to share? I'd love to read them. 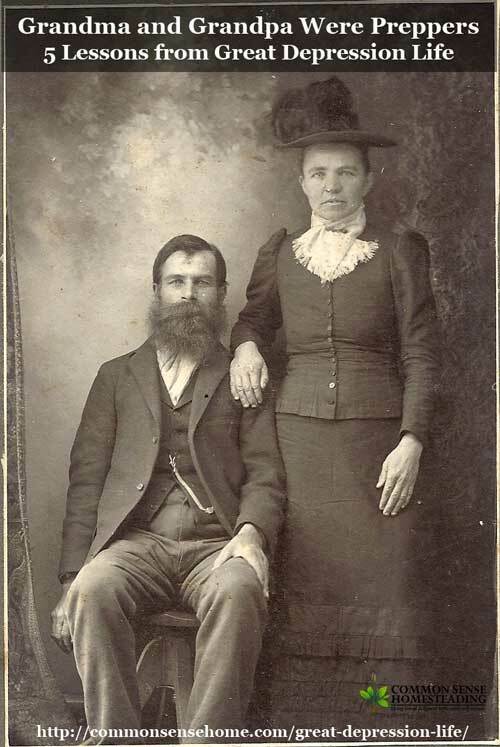 Note – It's my understanding that this was grandma and grandpa's wedding photo, taken years before the Great Depression, but I may be mistaken. This is the only older family photo that I currently have a copy of in my possession. Originally published in 2013, updated, 2016. I so rarely comment, but wanted to jump in and say that I’m so glad your husband is okay! Rush hour traffic is no fun at all and people often drive so crazy. What a scary thing for you all and again, I am just glad to hear that it will all work out alright…even if a new vehicle wasn’t meant to be in the works for a while. Things can be replaced, people can’t, right? Thanks, Heather. Yes, I was so relieved when I found out he was okay. The new (used) car has a blind spot warning light and alarm, so hopefully that will help keep him a little safer in crazy traffic. You brought back so many memories when you mentioned the pierzyna! My Busia made pierzynas. Nothing is as warm and comfy as a pierzyna on a cold winter night! My Dziazdzia worked in the iron factories in Milwaukee but he always tended the garden in their postage stamp of a city back yard when he was done for the day. There was room enough for only 1 tree so as not to shade the garden. It was a plum tree. In the winter my Busia used to wash his red flannel long johns daily (I think he had 2 pr) and put them through the ringer and hang them to dry in the kitchen combo dining room. I often think how would my Busia have done this or how would my Grandma have done that and if I think about it I can recall their methods of problem solving and work my way through. They were both “resourceful”…a word occasionally used to describe me but not always in a good way…but I love it anyway. Mom had wild plum trees near the garden and I used to love it when she made plum dumplings. I remember the ringer washer, too. That was all my other grandmother used during her many years on the farm. She had a rain barrel about ten steps from the front door, and always washed her hair in rain water to keep it soft. My husbands family has a book about the dust bowl. It’s called “The Worst Hard Time” by Timothy Egan. I have several stories about the Great Depression; here’s one. In west Texas, most of the neighbors were so poor that they couldn’t afford to buy license plates for their cars. My granddad had the only set of license plates in the county. When a neighbor needed to go to town, they would walk over and borrow my granddad’s license plates, wire them onto their own car, and return them when they got back from town. Thanks for sharing. That’s creative problem solving. As for the photo, it would make sense that it’s a wedding photo. Most folks generations ago would only rationalize taking photos for a limited amount of occasions, usually weddings and funerals. Also, it was more traditional in many parts of Europe to be married in black or navy blue than white. I have a photo of my great-great grandparents’ wedding in Europe and she was in a navy blue gown. I miss my pierzyna, but my husband overheats in his sleep, so we had to compromise with layers of quilts instead. Growing up, we had one on every bed in the house. My mother grew up on a cotton farm in Arkansas during the depression; the boll weevil was another burden added during that time. There was no market for their crops so they were very poor. They wore flour sack dresses,& only had shoes in the winter, even for school. She told me of the daughter of the richest family in the county who went to the same school. The girl (I picture her as Nellie Olsen) brought a banana for lunch every day & made a big production of eating it slowly in front of the other children. My mother rarely said a bad word about anyone but one day, when recounting this story, she said very quietly, “I hated that girl”. Funny now but sad as well. I am old enough to remember well the stories of the Depression. But then I was raised in a home with a dirt floor except for the bathroom. I remember stoking the pot belly furnace and walking the rail lines picking up coal all summer long for Pennsylvania winters. We were poor (very) but we were happy. I remember well the children of well off families making fun of us. When the SHTF they will starve and we will survive. – he eats what he grows himself, meaning foods with no preservatives, no cancer-causing chemicals, no trans fats etc.